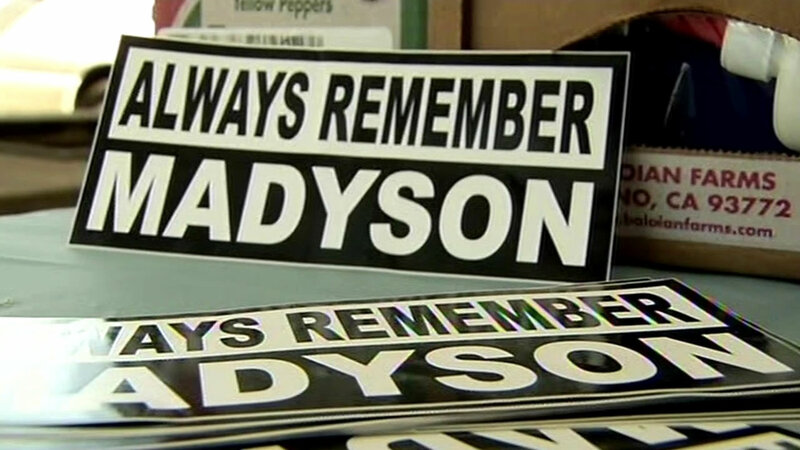 SANTA CRUZ, Calif, (KGO) -- Monday would have been Maddy Middleton's ninth birthday. Maddy is the Santa Cruz girl who was kidnapped and killed in July. A teen who lives in the same arts complex is accused in the killing. Maddy's family threw a birthday party for Santa Cruz kids in her memory. It's difficult to imagine how young kids handle such a tragic event. Maddy's parents and grandparents thought this birthday party might be just the answer to remember a special girl in a fun and creative way. At a memorial service in August, the mayor read a proclamation to commemorate her upcoming birthday. He said, "Now, therefore I Mayor Don Lane mayor of Santa Cruz do hereby proclaim October 5, 2015 as Maddy Middleton Day in the city of Santa Cruz." Maddy's mom hopes it will become an annual event. The little girl's grandmother, who she called Grammy, turned out early to help decorate the oak picnic area at Harvey West Park. Others helped put up streamers and balloons and other decorations to set a festive mood. They had no idea how many children would show up. Grammy made up 125 goody bags filled with art and craft goods. And there were bounce houses for the kids to let go. Party favors for Maddy's Day are seen in Santa Cruz, Calif. on Monday, October 5, 2015. And there are bounce houses for the kids to let go. "This is about the fact there was an eight, should have been 9-year-old child," said family friend Toni Riley. "You know, you celebrate kids, and we're going to celebrate. She's here in spirit, and we're going to have a good party for her." Riley went on to note that they picked all her favorite things, "Butterflies, wolves, bounce houses, cupcakes, all the good stuff." Maddy's mother Laura Jordan knows her daughter's death hit the Santa Cruz community hard. This party should help youngsters to heal from the shock and the loss of a childhood friend. "We're tired of grieving," she said. "Of course I'm going to experience more throughout my life. But the kids, I don't even understand how a kid can process this kind of thing. So, I just want to bring joy to the kids and to their families. And whoever is here to celebrate Madyson, I'm just grateful." Maddy would have been celebrating her ninth birthday Monday. Instead, a 15-year-old neighbor, Adrian Jerry Gonzalez, is going to be tried as an adult for her brutal murder in July. But for the children, it's time to focus on celebrating her life.